If you were to mention The Nature Conservancy to a gathering of farmers, you’d probably find a few who envision the nonprofit as an environmental group that would prefer to see cornfields turned into wetlands and wildlife habitat. While that has been the case in a few critical locations, The Nature Conservancy, in partnership with various corporations, has also done the opposite by working with farmers to everyone’s benefit. As a case in point, The Nature Conservancy, in collaboration with Nestlé Purina and Cargill, recently launched a three-year water project in central Nebraska to improve the sustainability of America’s beef supply chain. According to Hannah Birge, water and agriculture program manager at The Nature Conservancy, a large percentage of the water used in U.S. beef production is dedicated to irrigating the row crops that become feed for cattle. By putting first-of-its-kind, cost-effective irrigation technology in the hands of farmers, which will help them make more informed irrigation decisions, the organization hopes to see the amount of water needed for row-crop irrigation greatly reduced, along with the environmental impact of the beef supply chain. It’s no coincidence Nebraska was selected for the project. Home to an estimated 78,000 center pivot systems, the state has the largest share of irrigated acres in the U.S. It also ranks second in total cattle numbers and number of cattle in feedlots. Nebraska also overlies the largest portion of the Ogallala Aquifer, which stores as much water volume as Lake Huron. Yet, the aquifer has been declining over the years – as much as 60% in some states. Even in Nebraska, where it has increased in volume in a few areas, the aquifer continues to decline in other areas. Ground and surface water in Nebraska are highly connected, explains Jacob Fritton, water and agriculture project lead at The Nature Conservancy. As a result, water conservation efforts are also important in maintaining the wetlands and sandbar islands of the Platte River, which provide habitat and clean water for people and wildlife. Hence, the project seeks to enroll 50 farmers in the Central Nebraska Irrigation Project over the next three years to impact 75,000 acres in the Central Platte Natural Resource District (NRD). Although flowmeters are required by the NRD in some areas, they’re not mandatory where water has traditionally been plentiful. Consequently, Fritton says few farmers in those areas actually know how much water is being applied to a field. 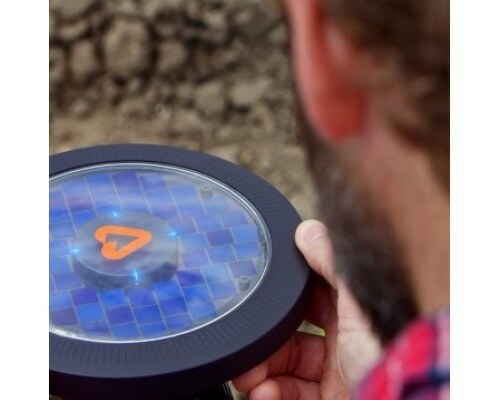 An innovative weather and crop-monitoring device from Arable Labs, Inc. is also included in the package. Mounted on a ¾-inch conduit pole that is tall enough to place the unit at least 3½ feet above the expected crop height, the Arable Mark combines weather and plant measurements. Solar powered and nearly maintenance-free, it collects over 40 field-specific measurements, including rainfall, dew, evapotranspiration, temperature, humidity, growing degree days, solar radiation, and plant health via a seven-band spectrometer. That information is sent to the cloud for retrieval anytime, anywhere. By itself, the Arable Mark lists for around $500, which is considered costly for a weather station. However, the device also monitors the crop for stress, pests, and disease indicators as well as growth and maturity. The final piece of the kit is remote control of the pivot. In some cases, that has meant adding an AgSense Field Commander remote irrigation management system, since it works on all brands and vintage of pivots and control panels. However, participants can also use a telemetry system offered by their pivot manufacturer. Regardless of brand, GPS technology provides real-time information about the pivot’s position and provides precise control of speed, direction, and more. At the same time, all control options, as well as customizable text messages and email alerts, are accessible on any smart device. Field to Market’s FieldPrint Platform tracks the project’s progress. The Central Nebraska Irrigation Project was initiated through the Midwest Row Crop Collaborative, a group of leading companies and conservation organizations focused on advancing farmer-led programs in water conservation, water quality, and soil health in key agricultural states. Diane Herndon, senior sustainability manager, Nestlé Purina, says, “Nestlé Purina believes in adding value to agricultural lands that represent our supply chain. Beef is a vital ingredient in many of our Purina pet foods. Yet, over 50% of the environmental impact of producing beef involves growing the corn used as feed. The whole idea of this project is to help farmers improve water-use efficiency in irrigated row crops used as cattle feed. This isn’t the first initiative of its kind. In cooperation with Coca-Cola, The Nature Conservancy also managed a three-year project in western Nebraska that began in 2014. 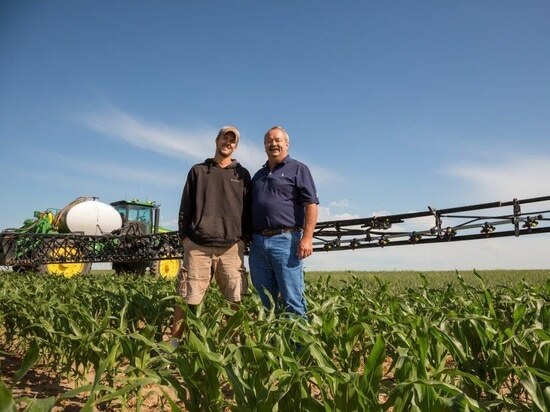 That project, which involved 11 producers and enrolled about 8,000 acres, was cost-shared 50-50 with producers who received soil moisture probes, field mapping to determine water-holding dynamics, pivot telemetry, and variable-rate irrigation prescriptions. After those three years, producers saw a 4-inch-per-acre reduction in water use compared with neighboring farms. Moreover, all have continued to use the tools, despite connectivity fees. 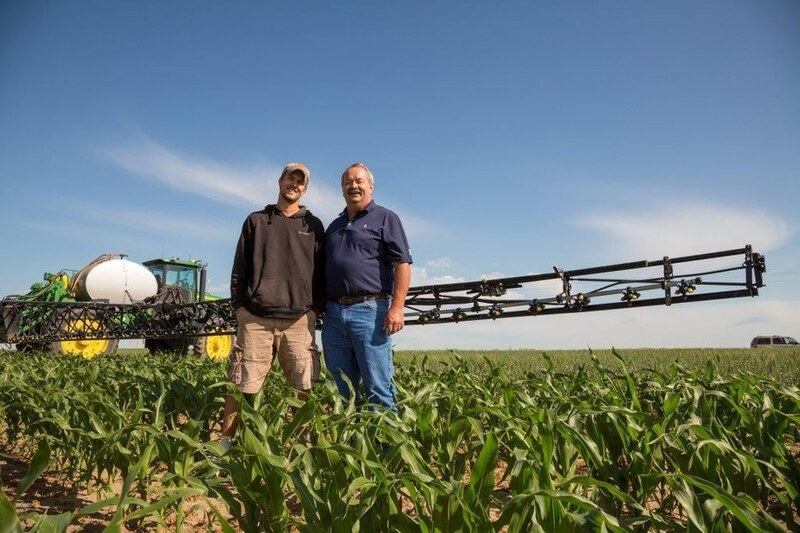 Pictured with son Zach (left), Roric Paulman (right), a Nebraska farmer and chair for the Nebraska Water Balance Alliance, served as a farmer adviser for a pilot project in western Nebraska.